Look, as much as I wish I could wholeheartedly cheers your post-workout 12oz curl, there's little scientific evidence to actually support any benefits linked to a post-workout "recovery" beer. Beer is great for social lubrication, but it's not exactly a performance-enhancing recovery drink... no matter how loudly you inform the bartender you're ordering your beer to "help you rehydrate." It's just not so. And yet, here's the thing: Maybe post-workout drinking isn't all about recovery. Maybe it's about enjoyment and bonding with your exercise buddies. And maybe, just maybe, all the studies pointing to the case against a post-workout beer (like ones indicating it's dehydrating, interferes with muscle protein synthesis, and ultimately increases recovery time) aren’t as big a deal as they seem. Because unless you're drinking to oblivion (which you really shouldn't be doing anyway), and unless you forego water and food completely (also ill-advised), a beer or two after breaking a sweat probably isn't going to hurt you that much, and it may just bolster your exercise habit. If you're exercising responsibly and drinking responsibly, perhaps the case for the post-workout beer lies in a single word: enjoyment. Believe it or not, a lot of people just like drinking cold bubbles after a workout. When I posed the question to my friends on Facebook, I received three different versions of the answer "Bubbles!" as to why they enjoy sipping on a brew post-sweat sesh. My sister said, "The carbonation tastes so good when you're thirsty,” a woman I used to go to church with said, "I like beer! I like carbonation, too!," and an acquaintance added, "I just want something besides water… and I like bubbles." I take all of this to mean beer is cold and refreshing, and after a tough workout, there's something to be said for cold and refreshing. There's no question that alcohol is a social lubricant -- it loosens people up a little, gets the conversation flowing, and helps turn a standard workout into an event… or an event into a party. Just take a look at all the races that now offer beer to participants at the finish line (Tough Mudder and Spartan Race are just two of 'em). Race directors know that finishing a tough event is celebratory, and that participants want to hang around with other racers to talk about the experience. Offering beer at the finish line is a way to encourage people to stick around, to cheers one another, and amplify the celebration. And if people end up having a good time, they’re more likely to sign up for more races. The concept doesn't just apply to races themselves, though. Casey Wetjen, a dedicated runner, points out, "My husband and our group of [running buddies] felt that a beer after a training run was a must." She joked the decision was based on the need to carb load, but really, it was more about turning the pain of a tough workout into an enjoyable social event. It offered a reward at the end of a grueling experience. If a cold beer and bonding time after a gym session make people more likely to exercise, I'd say it's a pretty fair trade-off. There are certain situations where I'd advise you to avoid alcohol after a workout. For instance, if you're a hardgainer trying to put on significant muscle mass for a bodybuilding competition, you probably don't want a beer or two to interfere with muscle protein synthesis. Likewise, if you’re a high-level athlete who needs to recover quickly between a series of back-to-back competitions (say, during basketball season), it’s probably not worth the buzz if a post-workout beer will delay your recovery time. But if you're just someone who likes to work out regularly as a way to stay healthy? 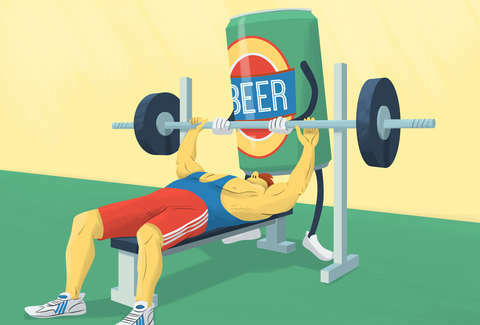 A beer or two after a workout isn't going to hurt you, especially if you follow the advice of a 2014 review study published in the journal Sports Medicine that suggests you consume less than .5g per kilogram body weight after a workout. For those of you who hate math, that's roughly two 12oz beers for a 150lb person. In other words: Drink in moderation. And while you're at it, eat some food and drink some water, too. It's good for you. Laura Williams is an exercise physiologist and fitness writer whose biggest health goal is to enjoy a balanced lifestyle, which sometimes includes post-workout beer(s). Check out her book, Partner Workouts, on Amazon, and connect on Twitter @girlsgonesporty.